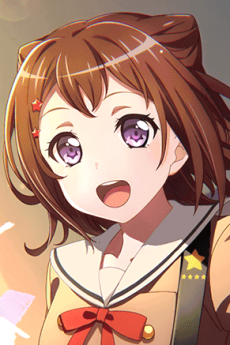 Kasumi is the main protagonist of the BanG Dream! franchise. She is a first-year student at Hanasakigawa Girls' High School and is the vocalist and rhythm guitarist of Poppin'Party. Kasumi lives with her parents and has a younger sister, Asuka - whom she calls "Aa-chan" - however it's not always clear who is the more responsible out of the two. When Kasumi viewed the stars one night as a child, she heard a sparkling "Star Beat" and she's been searching for it. She believes that she found it after founding Poppin'Party. Cheerful and always in high spirits, Kasumi is a playful, active and generally positive girl that always finds something to be excited about. She is capable of sharing a mental wavelength with Kokoro, something nobody else seems to be able to do. She is also the type to believe in (or fall for) the strangest explanations. However, Kasumi is also quite forgetful, tending to do important things by last moment (though unintentionally so.) She loves to tease Arisa, but given her kind personality, it's hard to tell if she is deliberately trying to provoke her or if she's oblivious. At times she can also behave melodramatically.